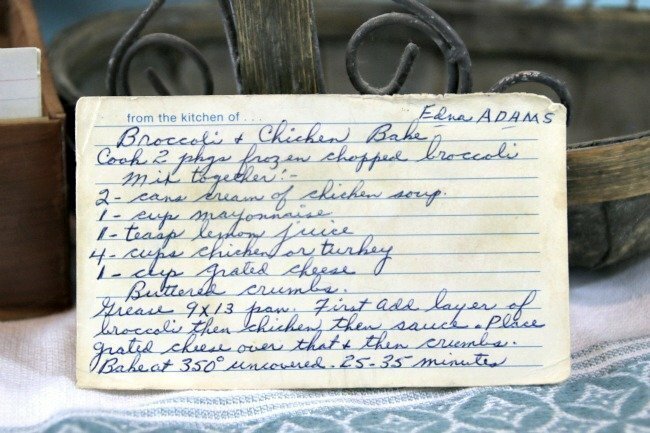 Front of the recipe card for Broccoli and Chicken Bake. 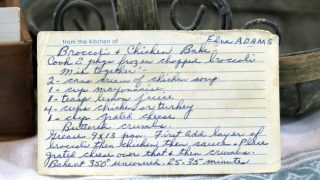 If Edna Mae KRESS Adams is the owner of this recipe box, then this is one of her own recipes. Edna was born March 12, 1925, Rowley, Buchanan County, Iowa and died February 17, 2007, in Salt Lake City, Salt Lake County, Utah. For this recipe, I would use a nice sharp cheddar for the cheese mentioned. There are lots of fun recipes to read in the box this recipe for Broccoli and Chicken Bake was with. Click here to view all of VRP015 – Wood Box recipes. Use the links below to view other recipes similar to this Broccoli and Chicken Bake recipe. If you make this Broccoli and Chicken Bake recipe, please share your photos and comments below!